Our Blessed Mother revealed to ‘Thornbush’ this prayer was inspired to the ‘Little Pebble’. O Eternal Father of Love and Mercy: I consecrate myself to You as Your creation of infinite value. Please take me and all that I am as Your little child, sinner that I am. Make me into Thy Pure and Holy Image, just as I was when I came out of Your Bosom, so when I turn to dust again, I will be as You desired me to be; so that I may live with Thee in Thy Divine Son, Jesus, and Thy Spirit, forever. Father, my Father: forgive my daily transgressions and blot out my sins, that You may only see the Likeness of Thine Only Begotten One, in me. 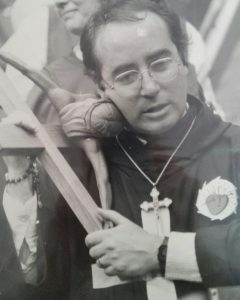 I Love You, Father, and thank You for my life. Your child. Amen. This prayer reveals the heart of William. The account that follows is an attempt to bring the reader to a true understanding of the real man … the soul who loved. On the 16th May 1950, from this rubble heap, a tiny dot of a boy entered into life. Just a glimmer of a baby really, William John the Baptist Scheuttler, was seven (7) weeks premature and weighed just 2 lbs. So sure the little man wouldn’t survive, he was given an emergency Baptism at three (3) days old and sent home with his mother. He was told later by his step-father that he fitted in the palm of his hand. He had no finger nails and his ears were curled inwards. A handkerchief was his nappy and, as he developed, he caught all the children’s sicknesses, including whooping cough. Hospital stays were a regular part of his early childhood. What a difficult time this must have been. William’s mother, Gertrude, was only seventeen (17) and living with her parents. Those early days were touch-and-go and one can only imagine how frail and precarious this situation appeared from the onset. Alone and pregnant Gertrude had lost all hope of contacting William’s natural father, although she knew of a fine young man who wanted to marry her. His name was Hans Schuettler. Born in 1926, he was still young when he witnessed the post war division of Berlin by the United States, France, Britain and Russia. This of course was all about power. Germany had been invaded and each of these four countries got a portion. Problem being that Russia’s portion controlled Berlin, the Nation’s Capital. Because of this, the United States, France and Britain, came to the decision that they would divide Berlin, so Russia did not have all the power. And so, as usual, man created a situation that caused many problems later on. So it came to be that Gertrude and Hans were married, prior to William’s birth, in a registry office. Hans was happy to be William’s registered father on the birth certificate and life proceeded. Hans was a gentle person and kept much to himself — he was not known to speak a great deal. Despite knowing William was not his biological son, he decided in his heart to love and care for him as his own.The young parents were new to bringing up such a tiny baby. It was providential that they lived with Gertrude’s parents, as this was a time when so much support was needed. Williams Grandmother, Anna was a beautiful soul who spent her life bringing up her seven children and looking after her husband. The children were all now grown and Anna treated William like her own son. Anna’s youngest son, also called “Willie” was thirteen (13) when William was five (5). There are fond memories of being wheeled around in a fun four wheeler pram type contraption by Willie. 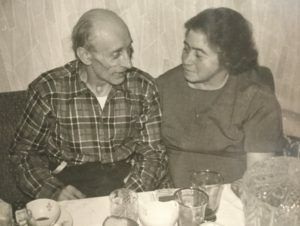 Williams Grandparents Gertrude and Wilheim Simons in their flat in Cologne, Germany in 1949. It was to this simple little family that William was entrusted. He was looked after well, despite being a very sick toddler. Even though like most people, Williams very early years hold very few memories. He does remember however the area he lived as a very young boy. The little four year old William recalls seeing tanks and machines of war abandoned in the streets among the damage. He remembers clearly the great treasure he found in an abandoned soldiers helmet left in the rubble. He recalls playing with it for many hours and like every innocent child, he understood nothing of war. Grandma brought William up during these early years, as his parents had to go out to work. Anna sewed ties to help supplement the small income. Little silver buttons completed the ties and served William too. Silver lined streets were built by little William using Grandmas buttons, a precious matchbox was the car. William loved this time with his “Oma” and she in turn with her “Sunshine boy” as she aptly named him. These were the earliest memories that remain. Happy ones. In 1954 change arrived. The young family had welcomed a little girl, who was now two (2) years old. There was also an invitation to go to Australia. Australia welcomed new people and the Commonwealth Government provided assisted passages. 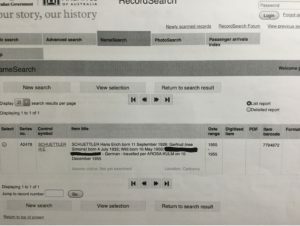 In return, the migrants had to agree to remain in Australia for at least two (2) years and accept the employment the government offered to them. William’s parents were seeking a better life for their family. The opportunity for stable employment and improved living conditions was the deciding factor in making a new life across the sea. It was an emotionally difficult decision to make for the young couple. Leaving Gertrude’s parents was not easy. The love and support would no longer be there, however, the chance of a new beginning was beckoning. An adventure, the mystery of an unseen land and so many dreams to finally make happen. How exciting! The experience of this voyage remained with William. To this little fellow, all of five (5) years, the Arosa was another world waiting to be explored. He still recalls the dining area on board complete with unique tables lined with ridges of wood, the purpose of which was to prevent the loss of one’s meal. He remembers how this area was often deserted, due to the dreaded sea sickness experienced by so many of the passengers. Williams poor mother was one of these, constantly green with suffering throughout the long weeks of turbulence. William and his little sister, being little children however, were never sick and this journey was proving to be quite an adventure. A real treat! It is these waves which toss and drench a happy William and these waves that hold the surprise of flying fish for our little boy. They seem to defy all logic. Everywhere he looks, they seem to appear. Just for him. He watches them race under the surface of the waves and then wonderfully launch themselves into mid air, over and over again. The fact is these torpedo shaped creatures build up speeds of up to sixty (60) km/hour under the water before breaking the surface and hurtling themselves in the air using their four “wings”. Heights of up to four feet are achieved and these marvels often glide up to two hundred (200) metres before hardly touching the surface again and repeating the whole process. Flying fish are attracted to light. The Sunshine boy was attracted to them. The Arosa Kulm stopped momentarily at Madagascar, a large island off the Southeast Coast of Africa. A land of lemurs, rainforests, beaches and royal palaces, which proudly decorate the hillside of the Capital, Antananarivo. Little William does not recall the name of the harbour, where the ship came to rest. The mind of the five year old was imprinted deeply however, with memories of islanders rowing their little boats hastily up to the ship. Boats laden heavily with glimmering trinkets, carvings, bananas and so many tropical fruits for sale. What a scene for a little boy, fifty or more little vessels filled with exotic goods and fascinating people, with magical voices filling the salty sea air with island tunes. How does this fascinated boy reach them? Although they appear within arms reach, ladders were placed so carefully between boats and ship so that people could climb down and purchase what ever they desired. What an extraordinary sight. And so came Williams turn. His legs were on the ladder in no time, each step bringing the treasure closer and closer to him. Everything was just waiting to be explored, touched and examined. A little world, all wobbly and unstable yet full of fun, now within his chubby grasp. These were the memories that remain. Finally, the ship docked at Fremantle, Western Australia. The Schuettler family’s new beginning. William climbed aboard the famous “Tea and Sugar Train” which was to take him across the Nullarbor Plains, where he was initially placed with his family. It was here that the family were placed. A few metres from the train tracks. A small home among just a few, was allocated to them for three months or so. These homes were serviced once a week by the Tea and Sugar Train. It was this magical experience William remembers so clearly. The Tea and Sugar Train brought essential services to the people who lived here. Although it had its beginnings in 1917 to provide building materials and necessities to the construction workers and their families, who built and maintained the track between east and west, the Commonwealth Railways continued to service the isolated Australian towns on the Nullabor Plain between Port Augusta and Kalgoorlie, long after the track was completed. William’s mother, Gertrude eagerly awaited the noisy arrival of the train. Complete with supermarket, refrigerated butcher’s van, haberdashery, furniture and pre-ordered alcohol, it was a welcome sight to the few locals who lived along its route. The train also provided much needed health care and even a Christmas car in December, complete with Santa. The days rolled together quickly, and three months later William and his family were allocated to a farm in South Australia’s Riverland town of Renmark, located on the banks of Australia’s longest river, the Great Murray. This mighty river rises in the Australian Alps and winds its way across Australia’s inland plains, where it borders the states of New South Wales and Victoria. It is aptly known as the “food bowl” of the nation. Ladybird was a well known lady in Renmark. 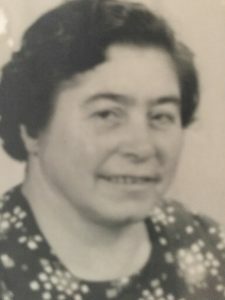 Her real name was Mrs Alice Jane Clark and she passed away in Renmark Hospital in 1960 at the age of ninety-three (93). She was the last of the original three hundred (300) settlers in Renmark. Ladybird and her husband, James William Clark were the first to successfully plant sultana grapes in the area and their vineyard was well known. Later, the Clark’s purchased steep sloping land and there built their home “Taranki”. By 1907 they had planted fifty-four (54) acres and also owned a further forty (40) acres of potential crop land. Ladybird’s husband died in 1937 and Ladybird was able to continue managing the farm with the assistance of a foreman. At Renmark Station, William and his family were welcomed by one of Ladybird’s staff. William recalls the heat and the rich red soil. They were driven to Ladybird’s farm, where they were given a home in the pump house, which serviced the pool. It was basically one room, approximately 4 metres square, with a dirt floor, no electricity and no furniture. A wooden “sweat box” was used for food and a smaller one covered with cooling damp hessian material, was also used to keep fresh food cool. Further sweat boxes were used for beds. The pool pump was also housed in this room although William does not remember any noise. The pool was close to the pump house and it was here that william learnt to swim. His father threw him in the pool and said “swim”. So, feeling himself sinking, young William thrashed with all his strength and he survived, again and again and again. In the years to come he would prove his stamina by breaking his high school record for swimming. William remembers the farm and Ladybird’s house. He recalls an orange plantation and an Australian mansion, home to Ladybird, smack in the middle of a hill. Famous in the mind of young William, as he travelled it daily on his way to school. Ladybird, he recalls was a very sick lady. She had many staff to look after her. One of the maids brings back fond memories. She was a lovely person who brought to mind old movies, where the cook was also a cupboard drinker. She was always sloshed! Gertrude also helped in the kitchen and the children often accompanied her. The maid often gave them freshly baked biscuits and cakes and other tasty food, in between secret sips from a little bottle placed carefully high on the pantry shelf. This intriguing ritual was noticed by six year old eyes and a little nose caught the whiff of her breath. These are the memories of a boy and a very kind maid. William’s parents worked on the farm in exchange for their little home. After three (3) months or so, Ladybird moved the family to a bungalow attached to the main mansion. It was known as the “packers quarters”, a lovely 2-3 bedroom home. The family remained here for a couple of years. This proved to be much more comfortable for the small family, who appreciated the welcome change. One of the fondest memories of a little boy while living here, was of a cheeky pet galah. He had apparently fallen out of his nest, while still a baby and was happily adopted by William and his family. Fed on oatmeal and little treats, he soon grew and became an affectionate family pet, who was even taught to speak! Life was good and days filled with honest hard work rolled together. Hans and Gertrude worked on the land as well as in other jobs in town. 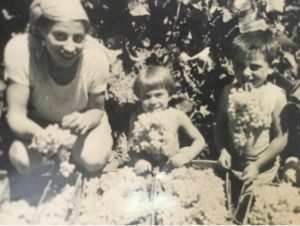 Ladybird appreciated their support and generous contribution and so, when William was close to seven, she offered the family approximately five or ten acres of vineyards, which was already in growth with grapes and four varieties of fruit trees, where they could build their own home. The dream of a promising new life was beginning to take form. Hans also worked as a bricklayer which came in handy, as he was able to use his skills together with other builders, to build the families new home. It was very stylish and definitely worth the work and the long wait. The cost of the initial land was returned quickly to Ladybird and in later years the family were able to purchase a further five to ten acres that did not previously belong to Ladybird and on this land they grew all of William’s favourite foods — apricots, peaches, pears and nectarines. Gertrude and Hans were very industrious, bottling their own fruit, making their own jam, sausages, smoked pork and other meat, and tending to the pigs, ducks and chickens, as well as the orchards. All this as well as working jobs in town — mother in the packing shed and father in the bricklaying business. So, brick by brick, the home was built, the family living in a small part of the house while the rest was completed. This also included their very own swimming pool. After some time and much hard work, the home and the land they purchased from Ladybird were paid for and finally the family owned a little part of the large farm. 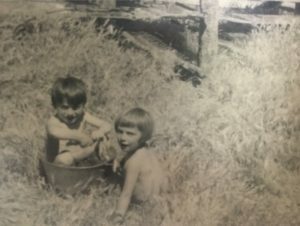 William and his sister trying to keep cool in the 120 degree Fahrenheit heat next to the grape drying racks in 1957. William’s life was stable and at the rather late starting age of seven, it was time for school. Renmark Primary School was five (5) miles from the farm, along one single road and William rode his bike. 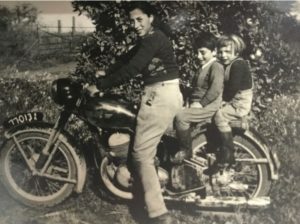 He loved school even though some mornings he and his little sister would hide in the orange trees till dad went to work, then the children ran gleefully home. The idea of “wagging” school was the most fun of all. This plan was foiled on one occasion when the mischievous pair were discovered under the bed by a surprised father and received a good hiding with the nearest sand shoe. School however was filled with fond memories. As a new boy William, being German, was teased especially as his last name “Schuettler” sounded a lot like “Hitler”. The small William took all this in his stride and was soon very popular among all his class mates. He proved to be a great little sportsman, excelling at every sport he played and also achieving high marks in the academic field. A successful all rounder. 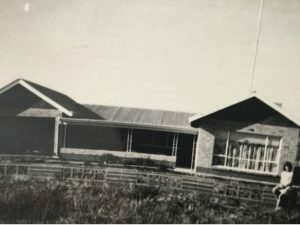 Later, William was shifted to North Renmark Primary School, a little further from the farm on the same street. West Renmark was closed temporarily possibly, due to repairs. He preferred his old primary school, however, in his last year at North Renmark, he and a friend were called in by the headmaster. The two boys had topped the school in math and the headmaster told them how proud he was. This meant so much to the little boy. Besides the academic achievement, making an “old man” smile was the best feeling ever. 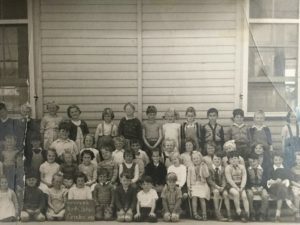 School photo – Grade 1, at Renmark North, in 1956. William is in the front row second from the right. He is six years old. Life was brimming over for young William. School mornings saw Mum and Dad off to work. Mum was still employed in the packing sheds and Dad had an additional new job working in the local distillery. He received a good discount on Penfolds flagons which later was to lead to a drinking problem. Hans was never a violent person however, even when under the influence of alcohol. His weakness was kept to himself. While the children were young, Gertrude would be home in the mornings to prepare them for school, however as the years progressed and William and his sister grew, she was able to leave early for work with their father knowing the children would be fine in getting themselves organised. William and his sister got along very well. The typical fighting among siblings did not occur between them. There are no memories of arguments or disagreements. The memories to this day are sweet of this relationship. One in which his sister always upheld him and was like a little mother to him always. In the afternoon, William was home by four. There were chores to be done, the cow needed to be milked. Every day two buckets of milk were put through a fun wind-up machine that separated the milk from the cream. The family even made their own cheese. William remembers well the old bath being used for all these projects! Today, all these methods would have been a hygienic write off, but back then the children ran in the sun, ate real food and had a very high tolerance to every-day germs. The chickens also needed to be fed and the eggs collected and the pigs — oh the pigs — what does a boy do with them? Well, one couldn’t just let them wander around. They had their own pen, and once in a while Hans had to kill a pig. William remembers sadly Hans grabbing the poor thing early in the morning and using the sledge hammer to crack its skull, amidst all the squealing. A most upsetting time. However, after the job was completed, William’s Mum and Dad made their own tasty sausages and bacon, so all was worth it. Harvest time was busiest as the family couldn’t afford pickers, so grapes, peaches and all the rest had to be picked after school for a few hours in the hot weather. Pruning happened around June/July and when William turned eleven years old, he drove the tractor. That was his favourite job of all. He would pick up the grapes and fruit, turn the soil and plough the land. Driving the car was also achieved at age eleven. It is very normal for farm kids to learn to drive at such a young age, William was no different, learning by sitting on his fathers lap. It was so much fun and life was balanced naturally between work and play. Children lived on the next farm and would come over regularly and the Schuettler children also visited them. There were so many games to play and even work was enjoyable. A little black mix of a dog named Rex was Williams very own. He was just like a tiny wolf. Sadly someone in the neighbourhood killed him by giving him meat containing glass. The grieving little boy buried his beloved doggy on the property. A tiny grave complete with a little cross marked the spot. A mischievous goat named “Darm Ta Darm” adopted from a little kid however, brought back so much joy for William. Darm Ta Darm was convinced he too was a dog. Certain school days saw William returning home eagerly on his bike at lunch time. He helped to tidy the home while he was there and then prepared lunch for himself and his goat. Darm Ta Darm scrambled clumsily onto the kitchen table and proceeded to demolish his portion while William listened to Blue Hills on the radio. If Mum or Dad happened to make a surprise early return, the goat learned to vanish hastily on cue. There have never been lunches as fun as those shared with his four legged guest. In 1956 came the Murray River Floods — described as the “greatest catastrophe in the States history”, it occurred due to high rainfalls in Western Queensland and three months prior in the Murray Catchment areas. All this water coming together and racing headlong down towards South Australia, proved more than an ordinary challenge for Renmark. 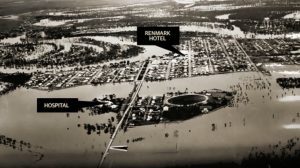 Renmark Floods 1956 – courtesy of the Adelaide Advertiser. William remembers the flood. He was six. He recalls being unable to cross Renmark Bridge to go into town, as it was too dangerous. The authorities had blocked it due to the fear of it collapsing. Hans, being so tall and strong, decided to swim across the raging river however, with young William on his back. The reason for this was never clear to the little boy, — shopping? work? Who knows. All William remembers was clinging on to his dad with all his strength, to avoid drowning. The family’s property, which received its irrigation from the Murray also came dangerously close to being flooded. It was a difficult time for the whole area. Damage to the town, farms and homes was extensive and took years to rebuild. Time healed and the mighty Murray River once again became the life blood of Australia. To William, who was now ten years old, this meant joyful times spent at near-by Paringa. Family barbecues and swimming with friends were enjoyed here during the long summer days. 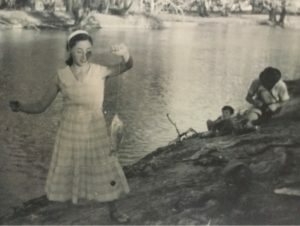 Renmark, South Australia – my Mother Gertrude Schuettler by the River Murray in 1957. Every two weeks on a Wednesday, William and his family went to the Chinese Gardens. There, they sat on striped deck chairs and watched the outdoor movies. Cartoons such as “Tom and Jerry”, and William’s favourite, “Road Runner”, were shown in between wonderful films of Cowboys and Indians. During intermission, everyone hastily headed to the tiny little ice cream stall for the best ice cream in the world. The Movies became reality once the family returned home. Slug guns were permitted at the time and even though William owned one, he preferred to play “Cowboys and Indians”, making bows and arrows with his friends. Playing “Romans with Swords” was also so much fun. Every six months or so the family had a real treat and went to the Renmark Theatre. The greats such as “Gone with the Wind”, “Samson and Delilah”, “Ben Hur”, and “Cleopatra” were all released around this time. Upstairs was too expensive, however it was a much awaited treat when the family would join with friends to view the latest releases. Ice cream was threepence and tasted nothing like it does today. It was the best ever! Due to the hot weather, “Guy Fawks” night was held in May. What a treat to build a beautiful bon-fire and stare into the dancing flames. This was a special night of the year. There was a twenty (20) foot antennae erected on Williams roof that he was sure was fifty (50) foot at the time. Despite the impressive size most of the channels were unable to be viewed due to the terrible signal. The weather played a big part. “Star Trek” depended on it. The children from next door proved to be a great support for William. Even at such a young age he felt a great love for Jesus in the Blessed Sacrament. Gertrude taught him the basics of his faith however his mum and dad only went to Church once or twice a year, three times at most. William desired to go more often and it was through his friends that this was made possible. Every two to three weeks, seven year old William would wander over to Dominic’s place and get a lift to the local Church. He made his first communion quite late, at the age of eleven (11). There was no startling revelation connected to this experience, but to a young boy being this close with God was simply, really good. 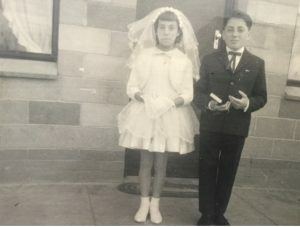 Photo of William and his sister taken in front of their home in Renmark in 1961 on the occasion of their First Holy Communion. So the days passed, William was hospitalised twice while he lived on the farm, once for in-grown toenails involving a painful operation on his two big toes, when he was nine or ten, and a tonsillectomy, which left memories of eating lots of ice cream. No complaints about that one! Overall, life was good and William loved his childhood. He had good parents who loved him and looked after him and he returned this love with all his little heart. A simple beginning for a boy soaked in sunshine in every way.